Jordan Watson is enjoying his loan spell at Sunderland RCA and says he is “definitely improving” as he nears a full recovery from a THIRD anterior cruciate ligament injury. The defender featured briefly in Blyth’s pre-season schedule, however, joined the Northern League Division One club on loan early last month in order to step up his recovery and begin playing competitive football again following NINE months out. Naturally, it has been a long and hard rehab process for Watson, requiring a lot of mental toughness to battle a third ACL injury – which he picked up at Curzon Ashton last September – however, he believes he’s “definitely improving” and is keeping in frequent contact with manager Alun Armstrong. 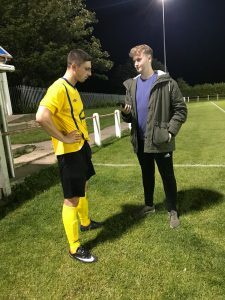 “The first few sessions were definitely the hardest but once I played again, it’s [the injury] completely out of my head now,” said Watson, speaking after RCA’s 5-0 derby win over Seaham Red Star on Tuesday evening. Watson played around 80 minutes at left-back before manager Martin Swales pushed him further up the field. He almost found himself on the scoresheet in the closing stages after goalkeeper Jordan Harkness denied his close-range effort with a top save. The former Northern Ireland U23s international looked assured and comfortable – completing a full 90 minutes at the Ferguson Motor Repairs Stadium, and Watson has spoken highly about the standard and competitiveness of the Northern League. “I knew what the Northern League was like,” he admitted. “Everyone talks about the Northern League – it’s probably harder than our league to be fair [National League]! Watson revealed he speaks to Armstrong every week and is fully aware of the big injury list mounting at Croft Park. With centre-backs Aaron Cunningham, Sam Brotherton and Ryan Hutchinson all sidelined, Armstrong may have no choice but to throw Watson straight back into the starting 11 when he returns within the next few weeks – something which the defender has no qualms about doing. He said: “I speak to the gaffer every week and obviously we’re struggling for lads now because we’ve got that many injuries so I’m dying to get back and get a game!